By Cory Ohlendorf of Valet. Alexander Olch is unapologetically dapper. Blame it on his background. A man-about-town with a Harvard degree and tours of duty at a prestigious Manhattan prep school, the guy knows his way around a well-dimpled four-in-hand. In fact, it was at Harvard, as a starving film student, that he fell into designing. Olch began making ties that suited his life—mixing and morphing Ivy Leauge prep with slick downtown cool. The result? Hand-crafted ties in luxe fabrics cut in new, modern ways. Before long, Bergdorf's came calling and a slew of stylish gentleman soon followed. We caught up with the designing director on a recent afternoon, in between editing sessions for his upcoming film, "The Windmill Movie." A selection of our favorite Olch ties for fall. From top: English wool herringbone, $150, Cashmere Glen Plaid, $180, Silk with embroidered hunters, $140, Hand-knit stripe, $200, Silk with embroidered crest, $140, English wool Repp tie, $160. You're a film-maker by trade, how exactly did you become a designer? Well, I've always been involved with design, bringing it in some way to whatever I'm doing. The ties began after I finished my senior thesis film. I decided to make the crew some ties as a souvenir. At the time, my friends were all going off, getting real jobs as bankers and lawyers and they started asking for them, so I made some for them as well. Then eventually, word spread. 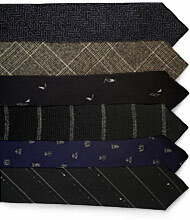 Have ties always been a part of your style? I went to Collegiate here in New York and had to wear ties with my uniform. Everyday. But I actually really enjoyed dressing up. In an all-boys school, most of the guys were dressing down at the time, so for me to go and find interesting ties and stand out was my way of rebelling, I guess. You must've amassed quite the collection. Oh, yeah. By the time I graduated high school I had over 300 ties. Nothing expensive, no big-name labels. I really took delight in going out to far flung places in the city, from thrift shops to the Salvation Army, to find a really great one. How many of those do you still have? I haven't really gotten rid of any of them, so I've still got those 300. And of course, at least one of every tie I've made to date. Wow. Where do you keep them? You know, I had this big plan for a huge tie rack in my apartment, with these elaborate hooks and each one would hold like 40 ties, but yeah, it just hasn't happened yet, so they're sort sprawled everywhere. Do you remember your very first? Wow. My first tie? I don't remember the first one I ever wore, but I remember in the 3rd grade, since we'd be required to wear one, we had this big tie-tying contest on the roof of the school. Our homework was to learn how to tie a four-in-hand knot and the competition was to see who could tie one the fastest. I got the most garish tie out of my dad's closet and started practicing. To this day, I pretty much wear the four-in-hand exclusively. What's your design process like? It's pretty pragmatic, actually. Sometimes I sketch out designs, but with others, you're just playing with the knit, folding it. It's really a tremendous amount of trial and error. I work with a lot of mills and I've started asking for their mistakes. If a fabric isn't working for them or if something's snagged or a bit imperfect, I might think it could make a great piece. That kind of problem solving, I think, comes from my movie training. 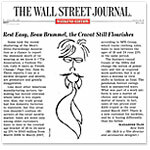 When the Wall Street Journal declared the tie dead, a clever Olch responded by writing a letter to the editor: "It's always a mistake to view shifts in fashion as final ... there's a new customer for neckties and he's buying differently than his father." For all the men not wearing ties, there's a whole new set embracing them. Thoughts? The 90s were such a time of young power players, when 30-year-old CEOs were going to the office in T-shirts and flip-flops. And I think a bit of that's just hanging around. But the balance has really begun to shift. If you're taking a girl out, you're going to want to look good and put on a tie. That need for formality has only increased as guys are paying more attention to what they wear. I'm doing a cool set of these very traditional, silk repp ties. There's a lot of blacks and blues. I'm playing with some embroidered insignias, a horse-and-carrige or a hunter and his dogs (see sidebar), those sort of old-world luxury motifs. And then there's some interesting details like ties with mismatched tails. Do you see Alexander Olch, the label, expanding anytime soon? I definitely see the brand expanding, but I'm not sure exactly and I'm not in a hurry. We are doing some bow-ties now and a few suspenders. Is there any place where you don't wear a tie? Alexander Olch's ties, $130 to $200, available at Olch.com, Bergdorf Goodman in New York, Opening Ceremony in Los Angeles and United Arrows in Tokyo.